The Bulldogs defense was superb tonight. Easton Wood took six intercept marks in the defensive 50 (seven in total). 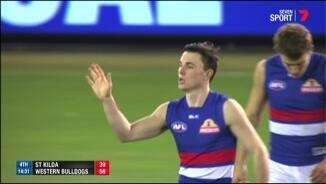 The Bulldogs dominated that statistic, taking 20 intercept marks to the Saints' nine. The Bulldogs hold on in a thriller. The Saints just couldn't find that last goal, despite making all the play in the last 10 minutes. 30 seconds left. Saints have the ball! What can they do? The Bulldogs have taken seven marks from opposition kicks this quarter, three of which have come in their defensive 50. Ross has had 10 disposals this quarter after coming on as the sub at three quarter time. Riewoldt has been crucial in the last two goals. He kicked the first, and set up the second with a kick to the top of the goal square after also setting up the chain from the wing. It's all happening! 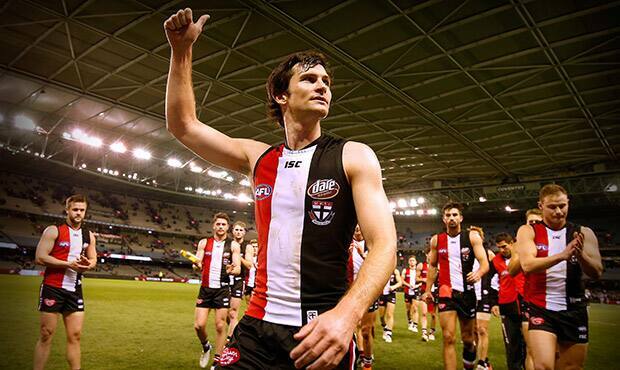 The Saints have converted their last two inside 50s into goals and are within eight points. Webb kicks the first goal of his career to give the Bulldogs their biggest lead of the game, 21 points. The Saints are looking a bit flatfooted this quarter. 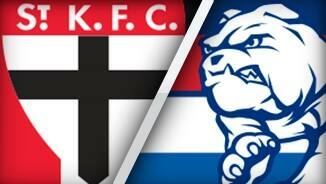 The Bulldogs have taken four intercept marks, while the Saints are yet to take one. 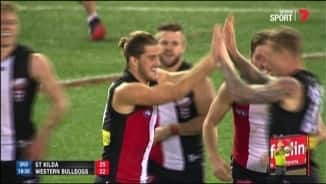 After the Saints kicked the first goal, the Bulldogs switched one, kicking the next four goals before the Saints settled and kicked their second for the quarter. 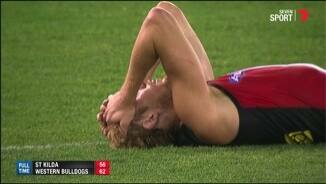 The siren just beat a Schneider snap at goal, denying the Saints their third for the quarter. The Saints have fought their way back in the last few minutes. They have had the ball in their forward half for 65 per cent of the last 10 minutes. During that period they have taken two marks inside fifty, kicking one goal. 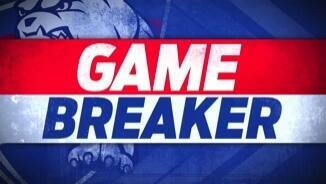 Western Bulldogs InterchangeBailey Dale off due to an injury. Bulldogs InterchangeBailey Dale off due to an injury. It's breaking down for the Saints at half forward. They have had seven chains starting in their defensive 50 this quarter and have not converted any of them to forward 50 entries. The Bulldogs are looking much sharper this quarter. They have kicked three in a row from six inside 50s. They are operating at 85 per cent disposal efficiency compared to the Saints' 63 per cent. Saints InterchangeJimmy Webster off due to an injury. Welcome to Etihad Stadium for the St Kilda v Western Bulldogs Round 13 clash. SEVEN weeks after being stung by a shock loss to St Kilda, the Western Bulldogs have exacted revenge by claiming a thrilling six-point win in the rematch at Etihad Stadium on Saturday night. The Dogs won 9.8 (62) to 7.14 (56), but not before receiving an almighty scare from the plucky Saints, who narrowed a 21-point final term deficit to get within a goal. A vintage stand from Nick Riewoldt, where the captain kicked one goal and then landed the ball in Josh Bruce's arms in the goalsquare for another, got the Saints right in it. However Easton Wood, clearly the Bulldogs' best player on the night, took a game-saving mark with just under two minutes remaining when the Saints were pressing with Riewoldt and Bruce looming large. The magnitude of the win wasn't lost on Bulldogs coach Luke Beveridge, who said it was a huge positive to prevail in such a hard-fought contest. "We never felt like we had any air. To persist like our players did, and to come out with the win it becomes just a really meaningful victory," Beveridge said. "It was a really different game. There weren't that many stoppages, a lot of turnovers and I just thought our defenders were incredible. "They intercepted and cut [the Saints] off. With the amount of entries that they had, they should have scored more goals but on open play our defenders just really held it together so that will definitely hold our backmen in good stead." 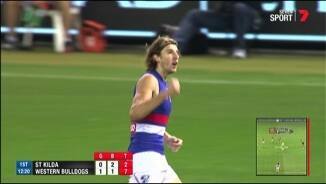 Half-back Wood – and captain Bob Murphy – were the architects of the Dogs' resurrection as a running, free-flowing team after a congested arm-wrestle of a first half. The Saints had opportunities as the game wore on but lacked polish with turnovers hurting them badly. 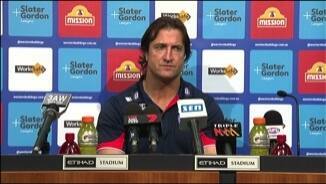 "It's very hard to defend when you kick it straight to them," coach Alan Richardson said post-match. "Some of our entries were poor. Wood was outstanding in the role he played. "Collectively, they marked 21 of our kicks, 12 of those were on our entries (inside 50) and we had a few blokes trying to get it done. "That was frustrating. 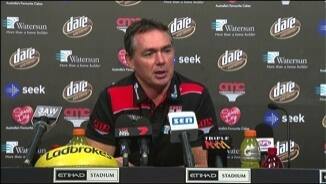 He (Wood) is in good form but turnovers were very costly." However, the Saints' pressure before half time was exceptional with the Dogs reacting with an old-fashioned flood that made scoring difficult. The tight, arm-wrestle of a first half bore no resemblance to the goal-fest played between the teams just last month. That afternoon, the Dogs slammed through 10 in the first half before the Saints' avalanche of 12 after the main break reversed a 55-point deficit into a seven-point win. On Saturday, there were just two goals kicked between the teams in the first quarter; six in the first half with no multiple scorers. But there were signs things would be different 30 seconds into the third term when the first centre clearance – won by Leigh Montagna – resulted in a goal to Bruce. It was short-lived joy for the Saints. 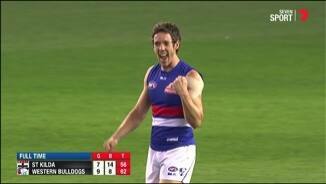 The next four goals went to the Dogs, with Wood and Murphy responsible for breaking open the game from half-back. David Armitage finished with a nine-disposal final term and Seb Ross came on as the substitute for 11 possessions, but it was always going to be tough after the Dogs nailed the first two goals of the quarter. Sam Fisher pulled out ahead of the game after hurting his back when he picked up some washing at home on Saturday morning, which saw Luke Delaney drafted in from outside the listed emergencies. The Saints will find out this week if they face a fine for Delaney's late inclusion but they would have been pleased with his performance against Tom Boyd who was kept to one goal and four marks. However, Richardson said Fisher and forward Jack Billings would be in the mix for next Sunday's clash with Essendon. St Kilda: Sam Fisher (back) replaced by Luke Delaney before the game.